Peggy J. 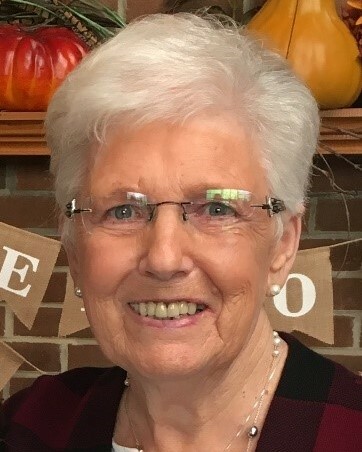 Hall, 83, of Stafford, passed away peacefully at her home on Wednesday, April 10, 2019. From her birth on March 18, 1936 to her death, she nourished people around her with love and faith. Peggy was born to the late Elliott and Maggie Berry and was the eldest of five children. From an early age she developed a devotion to family and friends that endured her entire life. Time spent with family was precious; Peggy experienced no greater joy or delight than to prepare and share a meal with family and friends. Whether as a daughter, sister, mother, grandmother, aunt, or friend, Peggy was always willing to give of her time and heart and asked for so little in return. Her spirit lives in the lives she touched. Survivors include her children, Michael Hall (Debbie), Barry Hall (Della) and Wendy Osborn (Mark); grandchildren Anna Burns (Ian), Elliott Osborn, Allie Hall and Chris Hall; and great-grandson Everett Burns. She was preceded in death by her siblings, Harold Berry, Tony Berry, Pat Raines, and Ralph Berry. A worship service in her memory will be at 1 p.m. on Saturday, April 20 at Aquia Episcopal Church with a reception to follow. Peggy treasured and faithfully supported her church. In lieu of flowers, the family requests memorial donations be made to the Aquia Episcopal Church, New Building Fund, P.O. Box 275 Stafford, VA 22555.